It's 2018...Does Your Brand Distinguish You from Other Veterinary Practices? Once upon a time, branding was all about a cattle stamp – the one that distinguished your cattle from the herd. (Are you feeling a connection?) Today, branding has evolved to symbolize all that you are – everything both tangible and intangible that ultimately sums up your identity and lets you outshine the competition. Can You Define Your Veterinary Hospital Brand? Your veterinary hospital's brand is so much bigger than your place and space. It identifies your philosophy and the excellent care you provide. It's the obvious answer to why a pet owner should choose you instead of the competition. Branding doesn't happen overnight. It requires a thoughtful strategy, one aimed at interlinking all facets of your veterinary hospital. MACRO (yourself, your staff, your product, your services) + MICRO (website design, mobile site, logo, consumer audience, etc.) = BRAND. Just as every interaction you have with pet owners creates an impression, your veterinary hospital's reputation is your own. Make your brand unique. Personalize it. Define yourself in a way that catches the client's attention and depicts you as the valued and trusted pet care professional that you are. VetNetwork is ready to work with you so that your veterinarian marketing brand is your spotlight – one that your clients (and prospective clients) cannot miss. Contact us to get started! Concerned about your brand, veterinary marketing campaign, or veterinary online reputation? We can help! 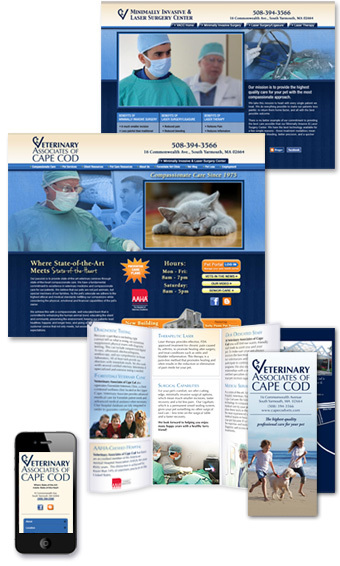 Read more for information about creating your veterinary hospital brand.